Synergy yoga instructor Nicole Pugh and Putnam County Library Friends President Andrea Batson find balance in the stacks at the PCL. COOKEVILLE – Synergy Mind & Body Studio will hold community classes Sunday, March 5, with all proceeds going to the Putnam County Library Friends. On Synergy’s monthly Community Day, class attendees pay what they can, and 100 percent of the proceeds go to a specified charity. On March 5, registered yoga teacher, Nicole Pugh, will teach community yoga at 2 p.m., and certified meditation teacher Petti Groth will teach a meditation class at 3:15 p.m. Synergy community classes are open to the public and are completely donation-based. 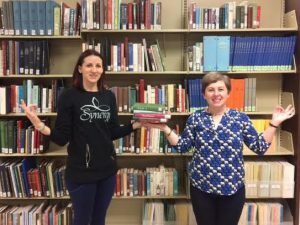 The Putnam County Library Friends is a non-profit organization that supports and promotes the use, services and facilities of the Putnam County Library System. Proceeds raised by membership dues and other fundraising efforts directly impact the library. The PCL Friends is a supporter of the library’s summer reading program. For more information, visit PCLibrary.org. Synergy is located at 139 E. Broad St. in Cookeville. For more information, visit SynergyMindBody.com.